Apartment in Heritage Hotel with rooftop pool. Hi, I'm Kerri, an Auckland born, Kiwi. After living aboard and travelling the world with my husband and three young sons, the love of family and NZ has drawn me back to my ‘blessed’ hometown, Auckland. 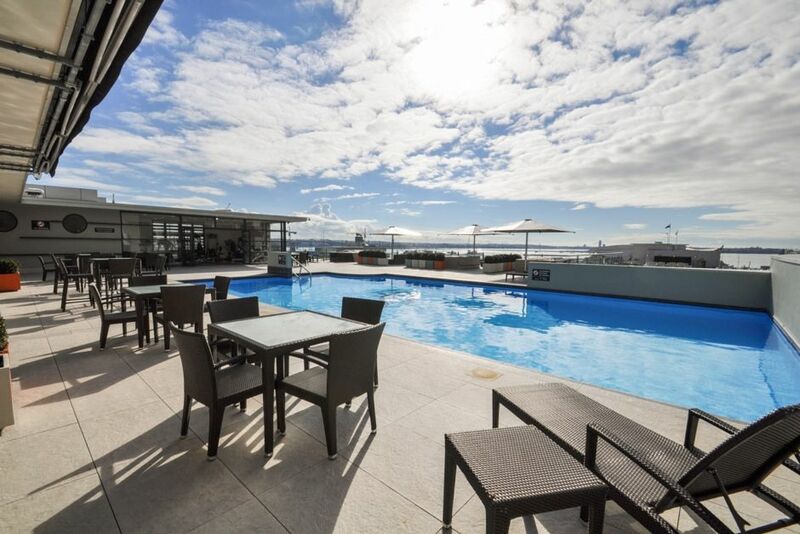 At home, I take advantage of what Auckland has to offer – spectacular outdoors, water, beaches, native bush, volcanoes, city ... Good wine, coffee, food and art :) Short-let accommodation has been and continues to be hugely beneficial to my travels. I hope that as a host I can help you get the best out of your stay here in Auckland, NZ. If you require something different or are travelling with a group you may be interested in looking at my other listing within the same building (enter the property number, 7624562, in the search field). Please feel free to contact me if you have any questions about my listing. Fond memories, a nostalgic building now updated for modern city life. As a child, it was one of my most exciting outings to visit what was once the 'Farmer's Department Store'. After my Mum did a bit of shopping, I would get to visit the rooftop playground. 'Hector' the talking cockatoo would always greet me too. It was an institution for generations of New Zealanders. It started it's life in 1914 as a mail order company which was then expanded in 1917 into a grand scale(over five acres of floor space) Victorian retail store, the 'Farmer's Department Store'. In 1935 it was modernized with an art-deco facade. In 1992 the store was closed to be re-opened in 1998 after a conversion into what is now the 4.5* Heritage Hotel. Of the 263 rooms, some are privately owned, this is one of them, I hope you enjoy it. Resort Facilities: Pools, gyms, spa, sauna, tennis court, restaurant, hair dresser + more Prime Position: By foot you can reach all that the city centre and its spectacular harbour offer. Historic Landmark building. Spacious bathroom. Separate tiled shower and bath. Toiletries provided. This apartment is in a prime central position. By foot you can reach all that the city centre and its spectacular harbour offer. A 10-15min walk takes you to the harbour's edge and the ferries/boats to explore it. Resort facilities: 2 pools, 2 gyms, spa, sauna, tennis court. Onsite hairdresser, spa treatments, restaurant, bar . A small view from the sunny bedroom window and a wide view from the communal rooftop terrace/pool area. All linens provided. A selection of pillows are available. Available in shared laundry areas(one of each of floors 3-6). $2 NZD per load. Laundry powder provided in apartment. Available in shared laundry areas(one of each of floors 3-6). $2 NZD per load. All towels provided - bathroom, kitchen and pool towels . Extra towels available. Two shared gymnasiums available. Hours 6am - 11pm. Children under the age of 12 must be supervised by an adult. Management accept no responsibility for injury. Three elevators in main lobby. One elevator for accessing rooftop. Sofa bed seating three and sleeping two(on request) at the extra person rate. Additional lounge chair and footrest. Modern Fisher and Paykel Oven. Dining table and chairs to seat 4 people . Open plan with lounge/kitchen. TVNZ and Sky Channels (80 Sky Movies, 81 Sky Sports 1, 82 Sky Sports 2, Sky News). Apple TV box, for you to access your Netflix account, Utube etc. Please logout of your accounts on departure. A selection of 'kiwi-style' board games, cards. Shared outdoor floodlit tennis court available. Bookings made through Tower block reception. Racquets and balls available. Children under the age of 12 must be supervised by an adult. Indoor shared sauna available in the Tower Block. Food and drink not allowed in the pool or spa pool. Two shared pools available (rooftop and indoor(Tower Block)). Hours 6am - 11pm. Children under the age of 12 must be supervised by an adult. Food and drink not allowed in the pool or spa pool. Indoor shared spa pool available in the Tower Block. Rooftop shared spa pool. Food and drink not allowed in the pool or spa pool. Host was very responsive and the unit was clean and very comfortable for our needs. Gym and pool was perfect for us. Great location and we really appreciated the little touches such as milk, tea and fruit for our use. We aren’t coffee drinkers but there was coffee available too. Can’t really think of a way the experience could have been improved. Thank you!! We loved being close to all the harbor action -restaurants, bars etc. Clean, central, with nice mix of classic and modern style. Fantastic host with apartment in historical building close to CBD, parks, waterfront and transportation. Clean and well appointed unit with classic character and modern personal touches. Rooftop pool with amazing city views. This apartment looks even better in person. Kerri provided helpful, detailed instructions. I would highly reccommend staying here and grabbing a drink at Caretaker. I would like to have given a 5 rating to the apartment as Kerri has thought of everything. The place was spotless, lovely bed linen and large comfy bed, and we enjoyed her tea, coffee and biscuits - just the ticket for a weary traveler. Soft towels, cleaning materials, pool towels, the lot. The reason for a 4 star is that this apartment is above an Irish Bar, which has live music and dancing on a Friday and Saturday evenings until 2am, and even though exhausted with 12 hour time difference and lack of sleep, I found it impossible to drop off. Thankfully the place was not booked for the Sunday night, and I slept well before we left. There is also a lot of early morning road noise, Auckland wakes up early to avoid the rush, and you are on a main arterial road. That did not bother me as much though. So, pack earplugs would be my advice! Otherwise the location suited us well, hop, skip and a jump from the Sky Tower (where you pick up most buses) and also from Viaduct Harbour, which we loved. Huge choice of restaurants and bars to relax and indulge in some people and boat watching. Very well located, clean and well-equipped. Bed was quite comfortable. Super shuttle from the airport worked well. Left our luggage in lockers at intercity bus station until check-in time. Glad to find tea and cookies in the cupboard. Kerri responded to our questions promptly and information about suite and Auckland was helpful. The heart of Auckland City. Sky Tower 4 min walk. Queen St and the Viaduct 5 min walk. Spark Arena 15 min walk. Auckland Art Gallery 12 min walk. Viaduct Harbour, Wynyard Quarter, Britomart, Federal St, City Works Depot. Uber-trendy Ponsonby Suburb, a pleasant 30 min walk or outer link bus or quick taxi trip (ramp outside the hotel). Luxury, boutique, souvenir and essential shopping all within a 0-10 min walk. If you wish to explore further, a 10 min walk will take you to the Britomart Transport Centre, Auckland’s main transport centre and the Downtown Ferry Terminal, your window to the beautiful Waitemata harbour and it’s islands.